Mitch McConnell wants FBI to investigate "bugged" campaign meeting. 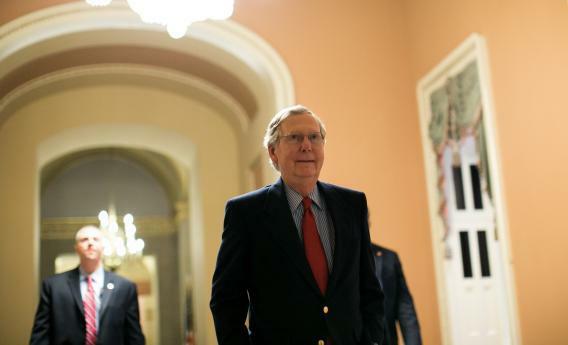 Senate Minority Leader Mitch McConnell (R-Ky.) walks to the Senate chamber in March. She’s clearly, this sounds extreme, but she is emotionally unbalanced. I mean it’s been documented. Jesse can go in chapter and verse from her autobiography about, you know, she’s suffered some suicidal tendencies. She was hospitalized for 42 days when she had a mental breakdown in the ‘90s. That sounds like spitballing to me. This isn’t 1972, and a female actress-activist isn’t Tom Eagleton. There are considerable risks involved with attacking someone for depression if she’s 1) never concealed it and 2) gone on to be a productive member of society. Yes, starring in Bug fits that bill. We’ve always said the left would stop at nothing to attack Sen. McConnell, but Watergate-style tactics to bug campaign headquarters are above and beyond. Sen. McConnell’s campaign is working with the FBI and has notified the local U.S. Attorney in Louisville, per FBI request, about these recordings. Obviously a recording device of some kind was placed in Sen. McConnell’s campaign office without consent. By whom and how that was accomplished presumably will be the subject of a criminal investigation. Having vanquished Judd as a candidate, McConnell now wrestles with her ghost. UPDATE: Greg Sargent talked to David Corn about the charges from Team McConnell.